One of my Christmas presents (thank you Gary!) 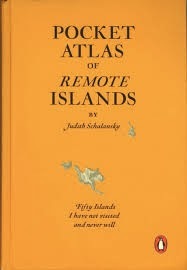 is an elegant little book, Judith Schalansky's Pocket Atlas of Remote Islands: Fifty Islands I Have Not Visited and Never Will. The author is also its designer and it's beautifully put together with simple maps and minimal text. It includes some quite well-known islands like St Helena in the Atlantic Ocean, where Napoleon was exiled; Christmas Island in the Indian Ocean, with its 120 million crabs; Iwo Jima in the Pacific, a turning point in the Second World War; and Robinson Crusoe Island, where the real-life Alexander Selkirk was marooned in 1704-7 and whose experiences there inspired Daniel Defoe to write his classic twelve years later. Most of the islands are tiny, and several remain uninhabited. Some of the text is a bit ephemeral and there are at least two cases where she's got her facts wrong. 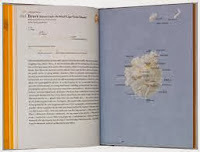 I love the idea that no-one has ever set foot on Peter I Island near Antarctica, but it's not true. I also like the story of Marc Libin, a French boy who was 'taught a language in his dreams' which later turned out to be the native tongue of Rapa Iti, an island of 428 inhabitants smack in the middle of the Pacific Ocean, to which he emigrated and married a local. The second part is true but the first is almost certainly fantasy.